After receiving his degree from Princeton in 1967, Richard Perle went to work for Sen. Henry "Scoop" Jackson, chair of the Senate subcommittee that oversaw the CIA's "black budget" for covert operations. In 1970, a federal wiretap found Perle discussing classified information with staff at the Israeli embassy. There is no indication he was reprimanded. In 1980, Perle left Jackson's employ and in 1981 he was named Assistant Secretary of Defense for International Security Policy, a post he held through 1987. In 1983, while working for the U.S. Defense Department, Perle also took payments to represent an Israeli weapons company, but was not prosecuted. In 2001, Pres. George Bush picked Perle to chair the Defense Policy Board, which advises the Department of Defense. 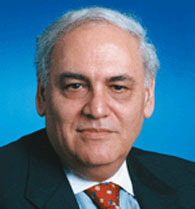 In 2003, The New Yorker pointed out that Perle had a conflict of interest -- with PNAC, CLI, and the Defense Policy Board, he was arguing for an invasion of Iraq, while he was simultaneously in business with Saudi Arabian partners and had connections to Trireme Partners, a computer firm that specializes in intelligence and would make a tidy profit if America invaded Iraq. "It's all lies, from beginning to end," he said, loudly threatening to sue over the article. A month later and much more quietly, Perle resigned as Chairman of the Defense Policy Board -- but he remained a member for another year, as America invaded Iraq. Perle resigned in February 2004, to pursue other interests. Those who fear and distrust Perle have labeled him "the Prince of Darkness," but his friends have lovingly adopted it as his nickname.